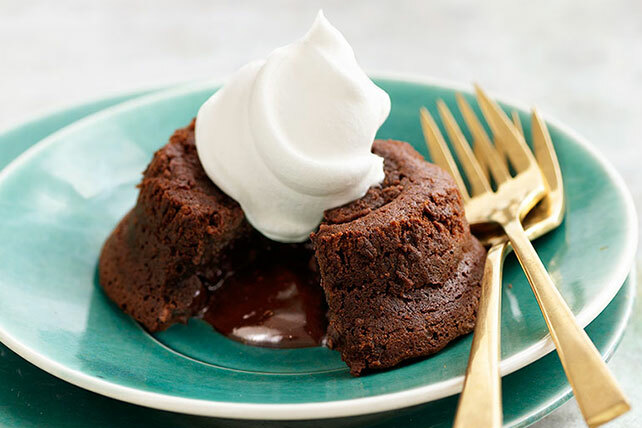 Dig into a rich and delicious Chocolate Molten Lava Cake and cue the ooey-gooey centers. This molten lava cake recipe makes 8 servings to savor. Butter 4 small custard cups; place on baking sheet. Microwave chocolate and butter in medium microwaveable bowl on HIGH 1 min. or until butter is melted; whisk until chocolate is completely melted. Stir in sugar. Add whole eggs and egg yolks; mix well. Stir in flour. Spoon into prepared cups. Bake 13 to 14 min. or until edges of desserts are firm but centers are still soft. Let stand 1 min. Carefully run knife around cakes to loosen; invert into dessert plates. Serve warm with COOL WHIP. Looking for the perfect chocolate dessert? One serving of these indulgent molten cakes is sure to hit the spot. Prepare batter as directed; pour into 10 paper-lined muffin cups. Bake in 425ºF oven 10 min. or until sides are firm but centers are still soft. Let stand 1 min. Makes 10 servings. Prepare batter as directed; pour into prepared custard cups. Refrigerate up to 24 hours. Let stand at room temperature 1 hour before baking as directed. Double all ingredients; spoon into 8 custard cups or soufflé dishes. Bake as directed. Makes 16 servings.